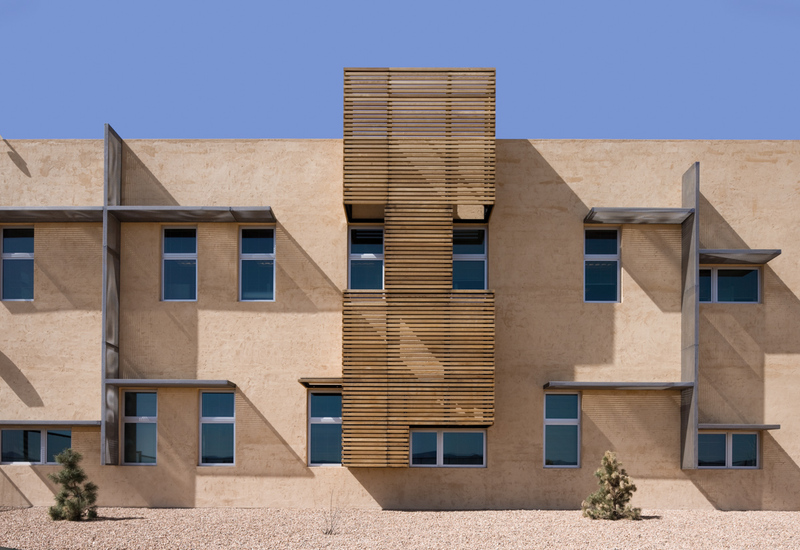 Over centuries, inhabitants of the desert Southwest have developed building traditions to mediate the region’s harsh climate and provide security for their communities. 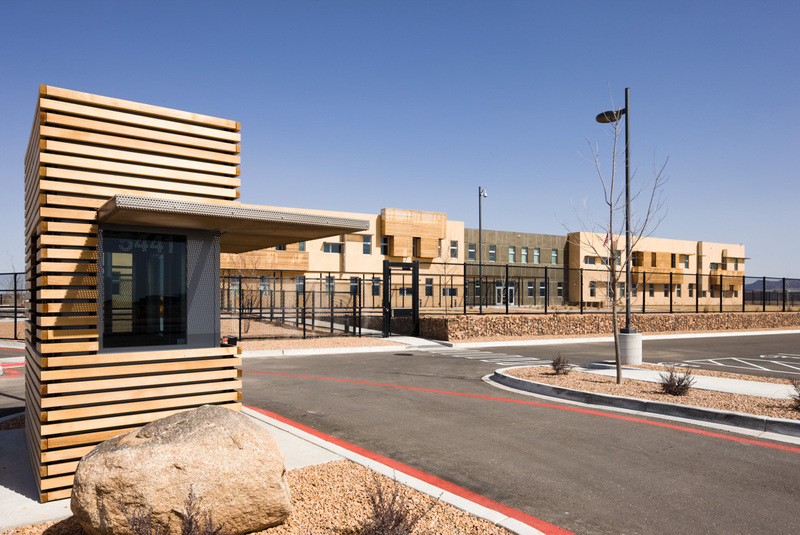 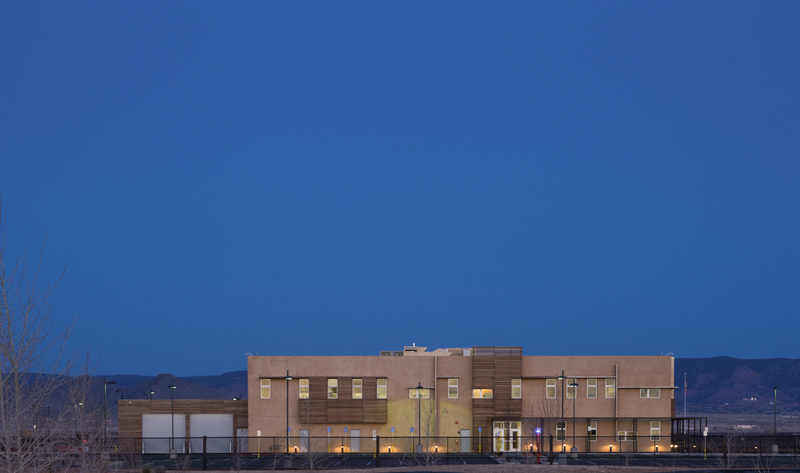 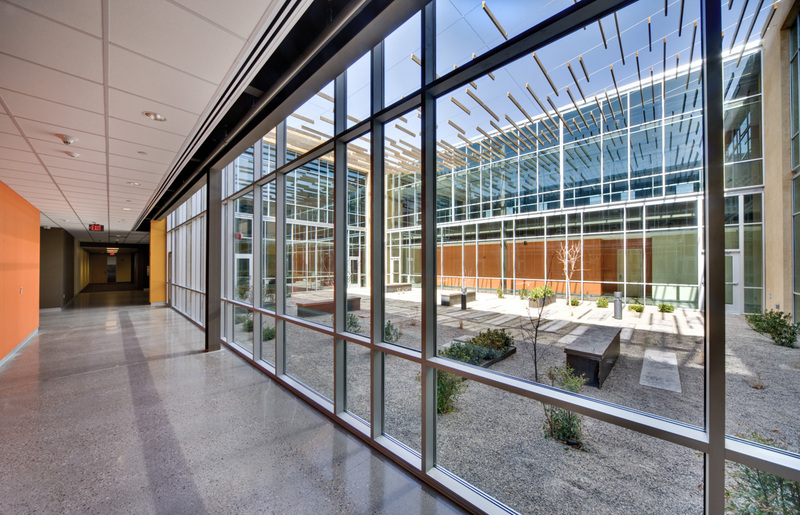 Those long-proven strategies were employed in the design of the 80,000-square-foot GSA Office Building in Albuquerque, enabling the LEED Silver certified, 21st-century workplace to blend in with the timeless beauty of the surrounding landscape. 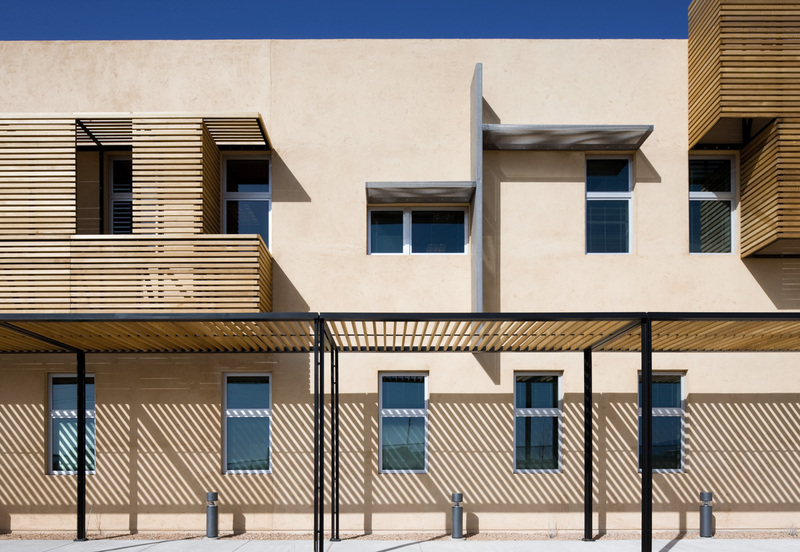 Borrowing from the region’s indigenous architecture, the designers planned the two-story office building around a central courtyard. 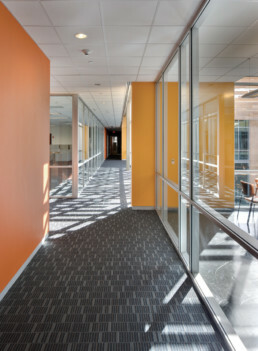 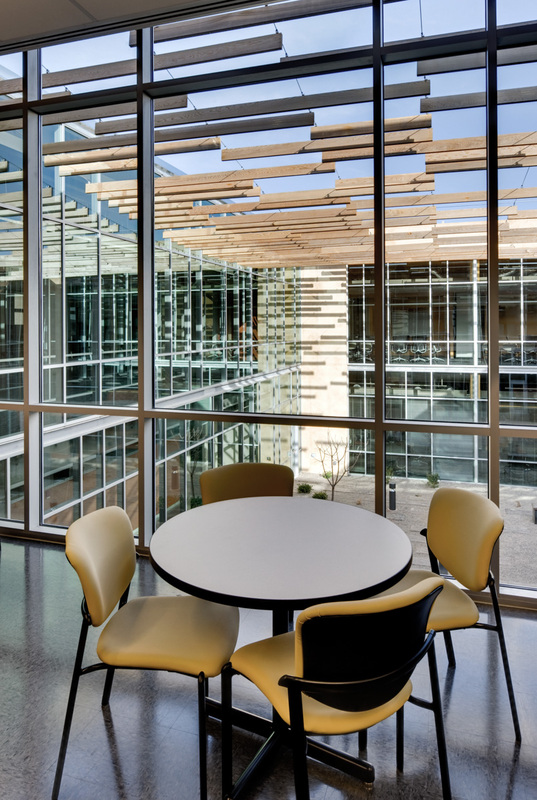 Double-height glazing on all four sides of the courtyard introduces daylight deep into the surrounding offices, public areas, and circulation routes. 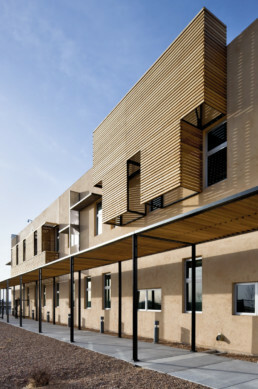 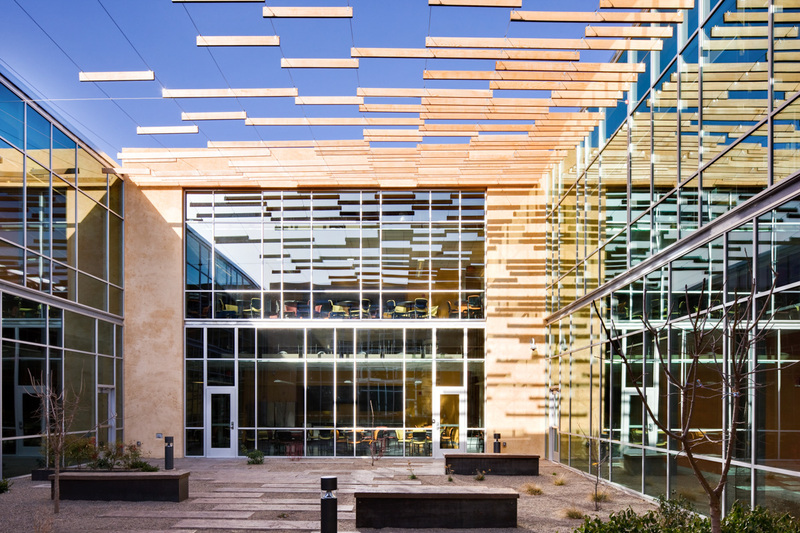 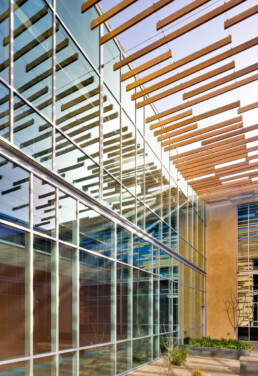 The courtyard is extensively shaded by a series of cable-supported transverse wood slats that are variably spaced to provide overhead sunscreening only where necessary—along the east, west and north courtyard facades. 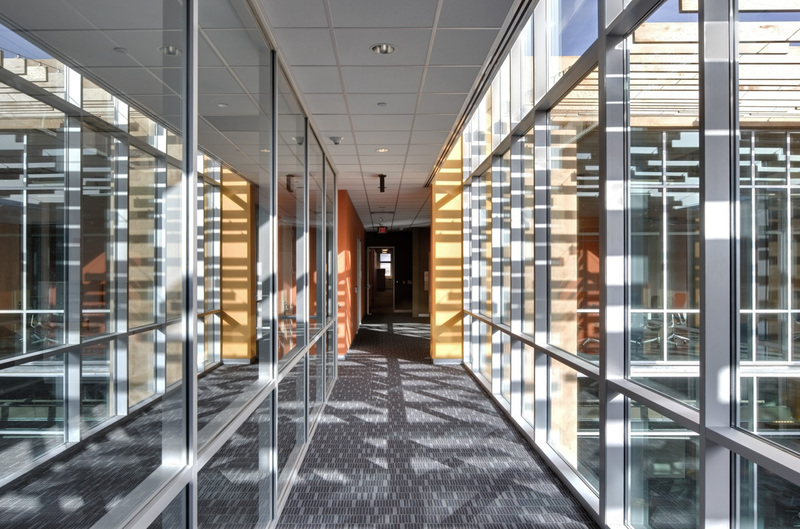 This appropriately controlled microclimate contributes to the building’s overall energy efficiency. 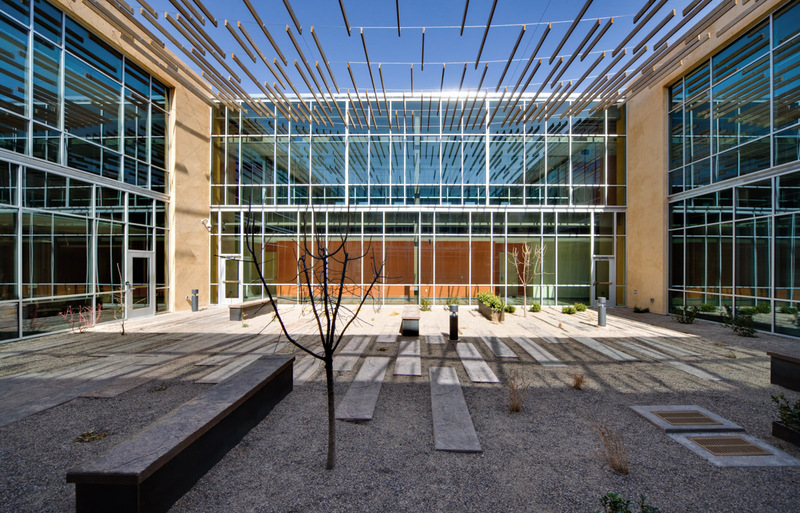 Trees, drought-resistant plants, and benches introduce a human scale to the courtyard and encourage daily use by building occupants. 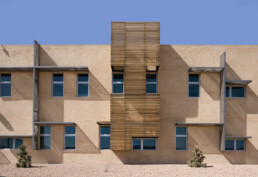 The integrally colored, plastered concrete block walls reflect New Mexico’s long tradition of singular, cementitious building facades that has roots in adobe construction. 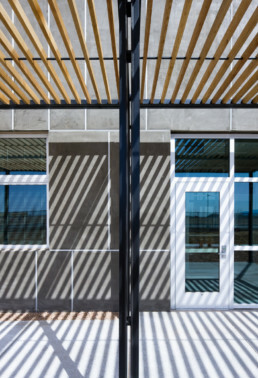 The thick masonry’s high thermal mass effectively dampens the comparatively high diurnal temperature swing characteristic of this region, reducing heating and cooling loads as well as equipment sizes. 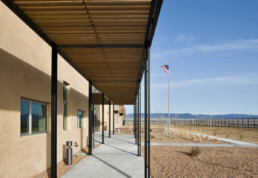 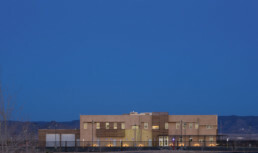 The long, low masonry enclosure and dry-stacked, rusticated local sandstone used in key locations ground the building to this unique landscape— particularly the Sandia Mountains beyond. 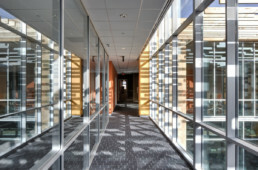 Deep-set openings for windows provide shade and shadow relief. 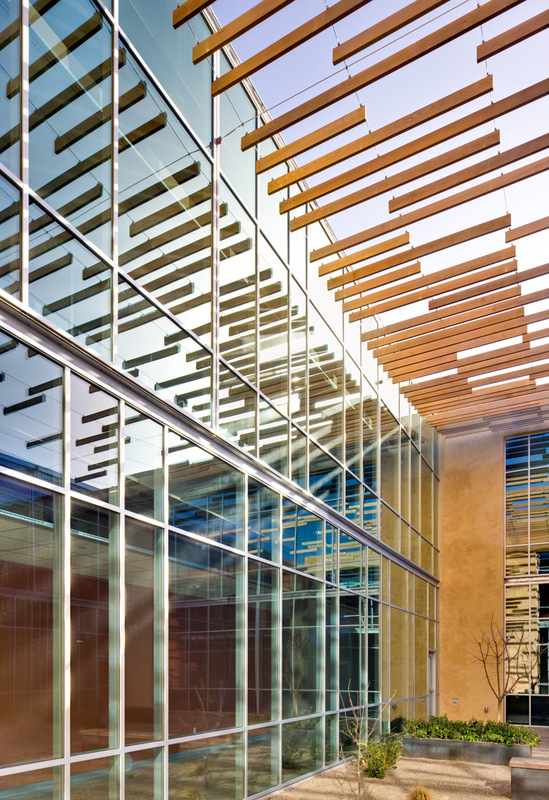 Exterior shading systems of wood and metal shield the glass from glare and add an interesting rhythm of surface articulation to the facades. 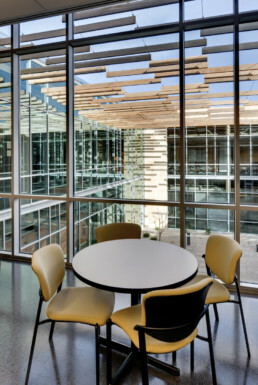 These shading devices utilize sustainably harvested wood held off the stout wall by a simple, economical metal armature. In key places, these sunscreens turn from vertical assemblies into horizontal trellises to mark the major entrances. Along outdoor perimeter pathways, wood and steel trellises provide shade and frame views to the mountains. Studies of various spatial arrangements led to flanking the courtyard with two office blocks. 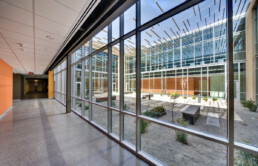 The building’s two-story configuration maximizes inter-departmental communication, while still allowing an excellent fit on the site. Visitor and conference areas are located on the ground floor, freeing up the second floor for unrestricted departmental office areas. 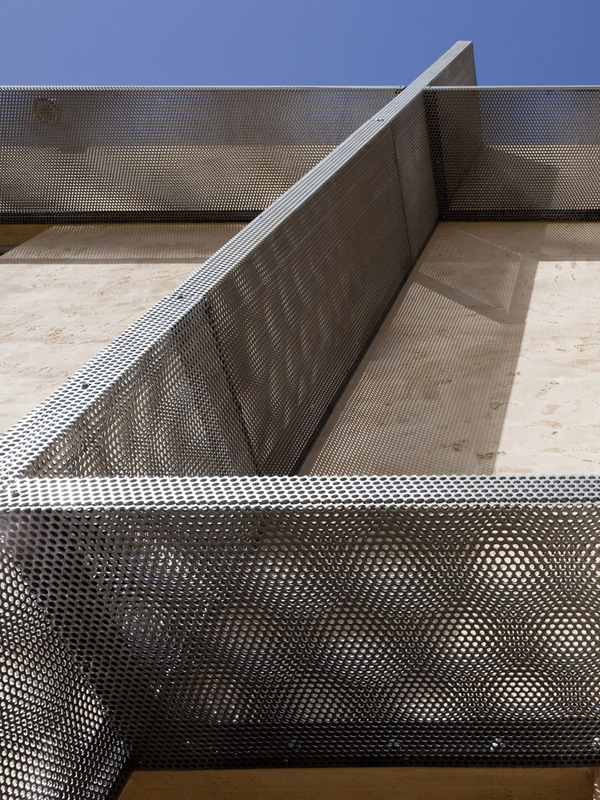 The floor plate dimensions provide the ideal 45-foot depth from core (and courtyard) to perimeter wall, which allows maximum planning flexibility. 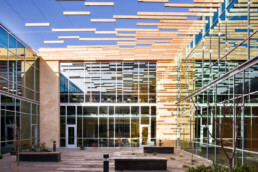 The main parking areas are tucked well away from these two roads, to better allow the building to sit strongly in the native landscaping. 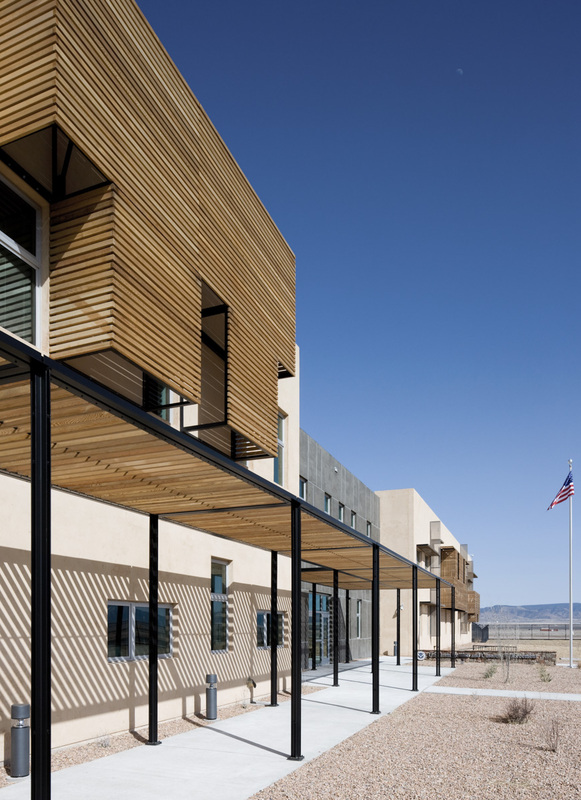 The building is located with its long face oriented north and south, which not only allows the preferred solar orientation for daylighting and sun control, but also affords greater views of the mountains to the north. 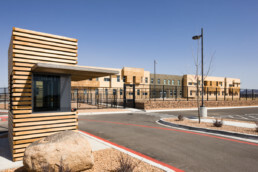 The building and parking areas are carefully configured to take advantage of and complement the larger development’s extensive landscaping and outdoor amenity areas that border the north and east sides of the property. 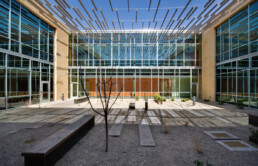 Landscaping materials are drawn largely from the local vegetation, with a wide variety of cactus, grasses, and succulents mixed with some trees at the front of the building. The overall effect helps this building, which was completed under GSA’s Design Excellence Program, appear to have always been here, working in harmony with the geology, topography and ecology of its environment.